William Morrow Paperbacks, 9780062403537, 256pp. Raymond Chandler meets Nick Hornby in this clever noir romp through hipster Brooklyn as a mysterious mix tape puts a young amateur sleuth on the hunt for a killer—and for the truths hidden within her own heart. To listen to someone else's mix tapes is a huge breach of trust. But KitKat was dead…and curiosity got the better of me. When a mix tape destined for her friend KitKat accidentally arrives in Jett Bennett’s mailbox, she doesn’t think twice about it—even in the age of iTunes and Spotify, the hipster residents of the Barter Street district of Brooklyn are in a constant competition to see who can be the most retro. But when Jett finds KitKat dead on her kitchen floor, Jett suspects the tape might be more than just a quirky collection of lovelorn ballads. And when KitKat’s boyfriend Bronco is arrested for her murder, Jett and her best friend Sid set out to discover the real killer on an epic urban quest through strip joints and record stores, vegan bakeries and basement nightclubs. But the further into KitKat’s past she goes, the more she discovers about her own left-behind love life—and the mysterious man whose song she still clings to…. 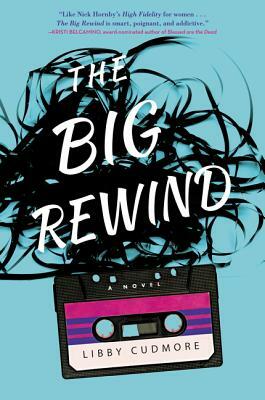 Like Nick Hornby’s High Fidelity for women…The Big Rewind is smart, poignant, and addicting. Libby Cudmore is a writer to watch. Irreverent yet intense, THE BIG REWIND mixes razor-sharp prose with graceful storytelling. To put it simply, Libby Cudmore rocks. Cudmore’s funny, breezy first novel...deftly melds mystery, romance, and music. Jett makes for a very refreshing lead in a novel that will appeal to twentysomethings as well as those enamored with Warren Zevon and the Vapors. Funny and smart, Libby Cudmore’s debut novel is an old-fashioned whodunit with a new-fashioned heroine, the irreverent, romantic, music-obsessed Jett Bennett. Heads up, vinyl-loving hipsters: Cudmore’s debut is for you ... Cudmore has preserved for all time a slice of current, hipster Brooklyn. Cudmore’s debut is a murder mystery, romance, coming-of-age story, and exercise in 1980s and 1990s music appreciation ... Recommended for Generation Xers who like fast-paced, hip, and seminostalgic reads. Set against the colorful background of New York City, this book will appeal to 20-somethings and serious music lovers. The writing is solid and the chapters are short and fast-moving.